A duplicated typescript with autograph manuscript corrections, and manuscript notes and additions by legendary silent screen comedian, Charlie Chaplin (1889-1977), of his screenplay, A Comedy of Murders, which would be released as Monsieur Verdoux, Chaplin's dark comedy of 1947 and favorite of all his films, has surfaced and is being offered by Bloomsbury - London (now Dreweatt's) Auctions in their Important Books and Manuscript sale, November 29, 2011. It is estimated to sell for £25,000 - £30,000 ($39,745 - $47,367). 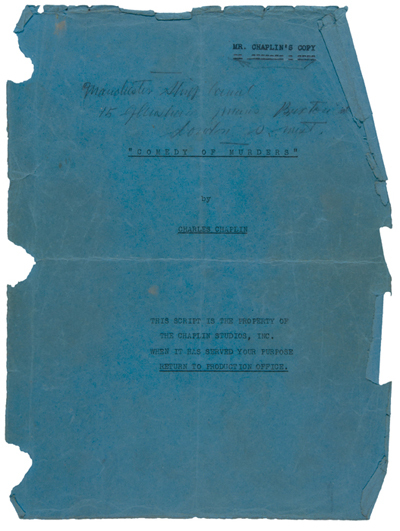 The forty total pages are comprised of eight pages of autograph manuscript that includes four pencil sketches by Chaplin, plus thirty-two pages of annotated and corrected typescript.The original blue wrapper to the screenplay bears the typed inscription, "Mr. Chaplin's Copy" in the upper right corner. Written, directed , and starring Chaplin, the movie was based upon an idea by Orson Welles. "It was Orson Welles who approached Charles Chaplin about a project based on the real-life French serial wife-killer, Henri Landru. Welles would direct and Chaplin would star. Rather than act in another director's movie, Chaplin bought the idea from Welles and made it his own vehicle, one that would forever banish the Little Tramp from Chaplin's new work. The result, 1947's Monsieur Verdoux, is Chaplin's anti-Tramp. Here in his most pessimistic film, there's not a jot of the sweetness and sentimentality that characterized his previous work. The intensely felt social criticism that audiences had seen growing in Modern Times and especially The Great Dictator is elevated to an astonishing level of sarcasm and subversive irony. "Subtitled 'A Comedy of Murders,' this mordant satire features Chaplin, at 58, as Henri Verdoux, an urbane Parisian bank clerk who loses his career in the Great Depression. Verdoux devises another means to care for his dear wheelchair-bound wife and the young son he loves - using make-believe jobs as cover for his travels, he woos rich widows in other cities, marries them, then murders them for their money" (Mark Bourne, DVD Journal). "Monsieur Verdoux featured Chaplin as a middle-aged Bluebeard who marries and murders wealthy widows for their money. Attacked as unseemly by some American critics, the film did better abroad. 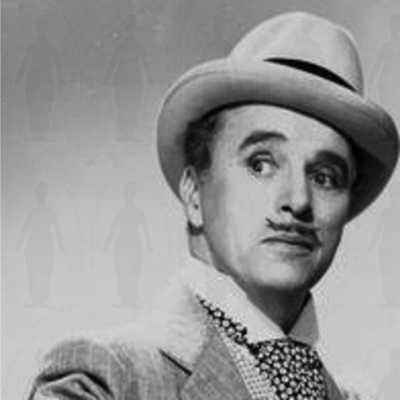 The black comedy of Monsieur Verdoux, the Joan Berry paternity suit, and the charges that Chaplin was a communist made the comedian a very controversial figure figure in 'McCarthyist' America. "It is ironic that Chaplin, who became one of the most successful capitalists of the twentieth century through his portrayal of a tramp, left America because of accusations that he was a communist." (Oxford DNB). CHAPLIN, Sir Charles Spencer, "Charlie", film actor and director, 1889-1977). 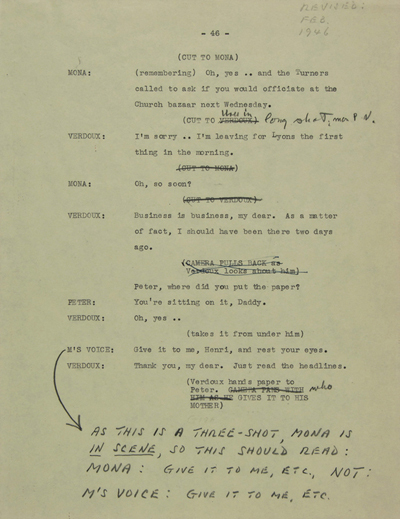 Comedy of Murders [Monsieur Verdoux], duplicated typescript with autograph manuscript corrections and additions by Chaplin, February - April 1946. Quarto. 40 pp (8pp. 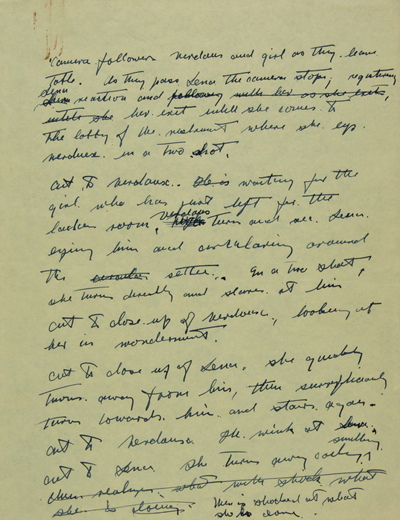 autograph manuscript & 32pp. 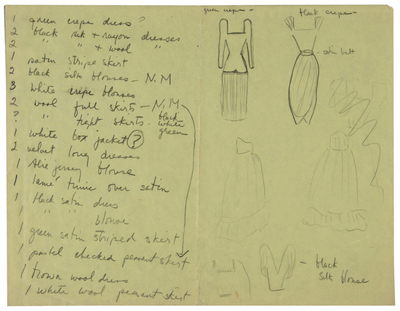 typescript), 4 pencil sketches by Chaplin, on yellow paper. Original blue paper upper wrapper, with typed inscription: "Mr. Chaplin's Copy" in corner. Bound in a modern red water silk lined full black morocco solander box. Images courtesy of Dreweatt's - Bloomsbury, with our thanks. Charlie Chaplin was a very intresting man. I love seeing his drawings and his writing (thinking) on paper. I am probley the biggest fsn of Charlie you'll ever meet. This is amazing. Thank you for posting. I have heard about a Chaplin 3-D movie? If you ask me lets give it a try. I mean at least we could.If your a fan of Chaplin as much as the next person, I'll be going to see it opening day. Keep up the good work! Thanks, Chaplin Lover.